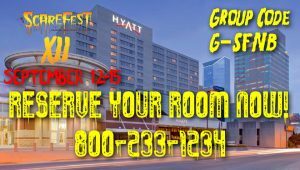 If you haven’t already made room reservation for the ScareFest XII, you can rent a luxurious, discounted room with plenty of southern hospitality at our official host hotel Hyatt Regency Lexington. Experience the comfort of their luxurious guestrooms or enjoy dinner and cocktails in the new Blue Fire Bar and Grill. While at the hotel; relax and unwind with a refreshing swim in the pool, or an invigorating work-out in the complimentary fitness center. 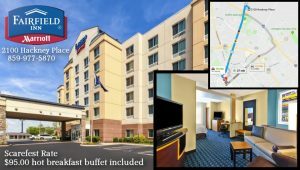 In addition to all of the amenities at the Hyatt Regency Lexington, they are also conveniently connected to the Lexington Convention Center, in the same building where ScareFest is being held. Hotel parking is located across the street from the hotel. Parking is complimentary for Hotel overnight guests, based on Hyatt Regency availability. There is a $20.00 per day charge for valet parking. The hotel has a complimentary airport shuttle, based on availability that provides transportation to and from the Bluegrass Airport to the hotel. Call 800-233-1234 to book by phone. When traveling to the Lexington for business or fun, the newest Fairfield Inn & Suites by Marriott Lexington North is the ideal hotel for you! Located at 2100 Hackney Place off of Newtown Pike it is just a short 10 minute drive to the convention center. It features some of the most spacious guest rooms in the area with free internet, an indoor pool, and a HOT free breakfast. Special Scarefest Rate: $95 per night available September 12-15 2019. Call 859-977-5870 and ask for The Scarefest Rate or book online. 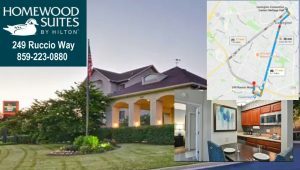 Welcome to the Homewood Suites by Hilton® Lexington. Located less than 10 minutes from downtown, our all-suite hotel provides thoughtful amenities to help you feel at home. Our Lexington hotel is close to Fayette Mall, Shillito Park, and many of Lexington’s best dining attractions. Enjoy complimentary breakfast daily, an evening reception Monday –Thursday, complimentary internet, 24-hour business center, modern fitness center and on-site laundry. Relax in a studio or one-bedroom suite, complete with fully equipped kitchen and pull-out sofa bed. Utilize the large work area, recline on the comfortable king- or queen-sized bed and enjoy your favorite shows on the flat-screen HDTV. Homewood Suites provides an unprecedented level of hospitality you’re unlikely to find elsewhere. Special Scarefest Rates September 12-15 2019. Call 859-223-0880 and ask for The Scarefest Fan Block or book online.